Over the last couple of years, Google has issued a number of different algorithm updates in the effort to provide users with accurate and high quality search results. 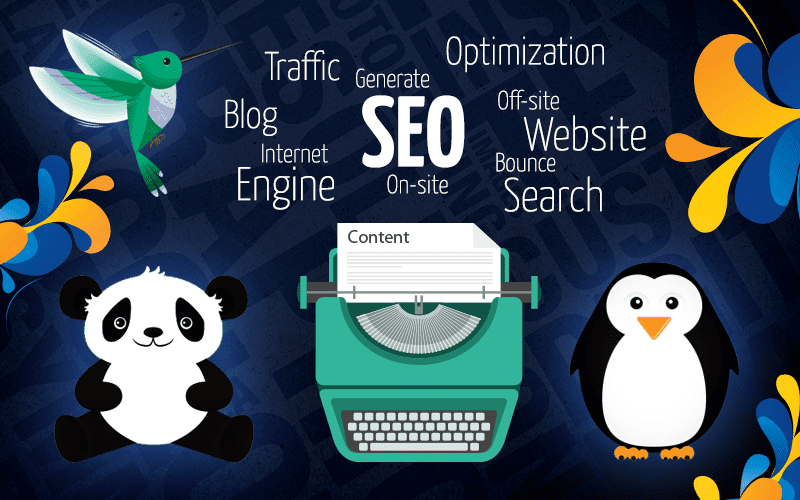 There have been four main algorithm updates (Panda, Penguin, Hummingbird and Pigeon), as well as a couple of smaller tweaks that changed the face of modern day on-page and off-page search engine optimisation (SEO). Now that you have some background to the relevance of search engines, it now becomes important to understand why search algorithms need to be able to provide users with search results that are both user friendly and relevant. Search engine algorithm updates focus on very specific aspects of the algorithm and have very different aims and outcomes. In an attempt to help you better understand modern say search engine optimisation, we are going to be running through some of the major and minor Google algorithm updates. This will provide you with better insights into what is required and what will get your website penalised – something that can prove tricky to rectify. Over the past 2 years, Google has slowly been developing and rolling out 5 major search algorithm changes that all target a different part of search. These 5 updates include the following update: Penguin, Panda, Hummingbird, Mobile and Pigeon. We will explain each of these updates so that you can be aware of what each one means and what impact it may have on your website. The Penguin update is a Google algorithm update that launched back in April 2012 to combat those website that are seen to have spam-like results. The primary focus is on websites that have a very high amount of purchased links, low-quality spam links and links that are designed to manipulate search result. This update also focussed on other areas of search spam that include keyword stuffing and cloaking content. This update is regularly refreshed, so websites that were hit with a penalty are able to recover, but it also means that websites that were not impacted stand the chance of being penalised. You may have heard the phrase “content is king” and wondered what that means or why it is so important. The reason why that phrase has been used a lot in the SEO arena is due to the Panda update that was first launched back in February 2011. This Google algorithm update’s primary focus was preventing websites with poor quality content from reaching top search results. It is important to note that this update not only focuses on poor quality content, but also focusses on thin meaning low word count) and duplicate content. This is also an update that is refreshed, meaning that both recovery and penalties are possible. Unlike the two penalty-based algorithm update discussed above, the Hummingbird Update is not a penalty-based update, but rather a change in the way that Google reacts and responds to various search queries. This updates is a new platform designed by Google in an attempt to better understand the meaning of words and not just render results based on matching words together. There are quite a lot of technical insights and changes in this update a deeper look into the Hummingbird update will provide you with all the information you need. Taking effect on 21 April 2015, the Google Mobile Update was launched to expand the algorithm to incorporate mobile-friendly design as a ranking signal. This update is specific to mobile search in that mobile device users will be given results that are no longer difficult to navigate and had a significant impact on search results. In preparation for this update, Google made available many different tools to check compliance to ensure websites meet mobile-friendly requirements. The final of the major updates is an updated dubbed the Pigeon Update by Search Engine Land. This update is a new algorithm to provide more useful, relevant and accurate local search results that are tied more closely to traditional web search ranking signals. Google stated that this new algorithm improves their distance and location ranking parameters. This article provides additional details. The first of the minor algorithm updates, called the Payday Update is described by Search Engine Land as follows: “Launched on June 11, 2013 – the “Payday Update” was a new algorithm targeted at cleaning up search results for traditionally “spammy queries” such as [payday loan], pornographic and other heavily spammed queries.” The most recent update, Payday 3.0, specifically targets spam search queries as opposed to actual spam sites. Another of the minor updates that was released, was one that was pushed into the algorithm without warning – resulting it being named the Phantom Update. This algorithm is ultimately an update that compliments the Panda update in that the focus is on the quality of content. Phantom aims to better understand high quality content so as with the Panda update it is vital to create new, unique and high quality content and website. As long as search and algorithms have been around, people have been trying to manipulate results. In the past search engines were not as proactive as they are now, with regular updates constantly shaking up the search industry. Even though it is extremely difficult to stay on top of changes, it is important to know what requirements are as things that worked in the past may get you penalised now. If you want to make sure that you do not get a penalty handed down to your website, then make sure that you create unique content that your audience wants, do not buy links and do not try to manipulate results in any way. This will only result in more work in the long run as you will need to change everything back to specific requirements and wait for updates to get the penalty lifted. Savvy Sprout is a Cape Town based digital marketing, design and SEO company that focusses on giving smaller companies the big brand experience without the big brand costs. We aim to provide realistic results based on thorough analysis and provide smaller businesses with the knowledge, tools and insights they need to grow and increase competitiveness. If you have any questions about search engine optimisation or modern marketing techniques then drop us a message and see how we are able to help.